When Vincenzino and I went shopping in the tiny fish market in Ravello on the Amalfi Coast in Italy he asked if we should pick up some squid. I reflexively said, "No - yuck!" I'm sorry I was so closed-minded about it. Recently, Janel, a friend from the Y, told me about a calamari dish she had prepared and liked very much. (Even calamari sounds more appetizing than squid.) So I figured I would try out a recipe of my own. I thought I'd do a do a quick sauté of the squid and serve it with a spicy marinara sauce. 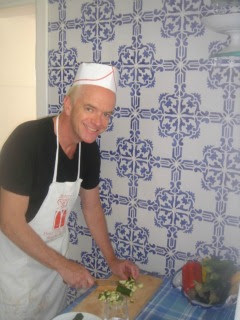 Over the weekend I watched an episode of David Rocco's cooking show - and he was preparing squid. He advised that you cut the squid into 3/4" rings - he advised that you don't make the rings to narrow. I bought a little over a half pound of squid - which cost under $5 - and chopped the flat part of the squid into the rings. I left the parts that look like small octopuses as is. Despite never having cooked squid, I knew that it should be dry, so I blotted the excess moisture with paper towels. After that, I dredged the squid quickly through flour and was sure to shake off the excess flour. Ann Burrell of the Food Network advises that you quickly dredge items quickly and don't leave them for any period of time in the flour. I think lumps of flour can stick when you leave them sitting in it for too long. I wanted to cook everything in the same non-stick skillet so I started with the marinara sauce. I love Mario Batali's cherry tomato sauce that comes in a jar. But to make it my own I sauté my own cherry tomatoes in extra virgin olive oil. When they are nearly done I add chopped fresh garlic. When the tomatoes and garlic are done I push them to the side of the pan. I crank up the heat, add some more olive oil and when the pan and oil are really hot, I add the squid. As you can imagine, the calamari cook very quickly. Swirl them around in the hot pan - mine took about 2 - 3 minutes to cook through. At the very end I add the jarred sauce. I put it in a bowl and heated the marinara in the microwave and then added to the pan. I dust it with red pepper flakes and squeeze a lemon into the mixture. The calamari were cooked and I didn't want to overcook them by cooking the marinara in the pan. I'm trying to limit my carbs so instead of serving over pasta, I served over roasted asparagus. It was really delicious and low in calories and fat. I have a tradition of buying a rotissierie chicken with all of the fixings on Friday nights. It's kind of ironic when you consider I was raised a Catholic and was taught to eat fish on Fridays - and now I have fish for dinner every night except Fridays. It's because my cleaning lady comes every other Friday and I try not to mess up the kitchen by cooking something splattery. And I have leftovers for the rest of the weekend. I like it so much I do this even on the Fridays that the cleaning lady doesn't come. The fixings include things like roasted potatoes, roasted cauliflower and broccoli rabe. Over the past few weekends I've made a salad with the leftovers and it's really delicious. I start with my old standbys of arugula and cannellini beans at room temperature. Meanwhile, I heat some of the leftover chicken, potatoes and cauliflower and toss in cherry tomatoes and kalamata olives. The pièce de résistance is a runny poached egg. If you can't swing the poached egg, a soft fried egg is just as good. I was a bit apprehensive about poaching an egg, so the first time I tried this recipe I fried an egg and it was great. But I thought a poached egg would be better. My friend Alan told me about an egg poacher he uses. You just crack your eggs in the poacher and microwave them. 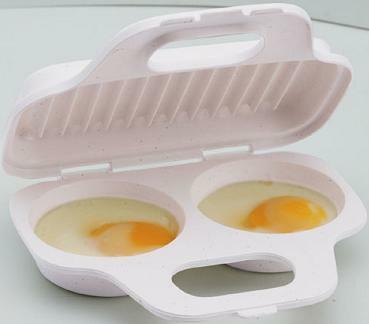 I found the egg poacher at Bed, Bath & Beyond for $3.99. It works great but I'm still fine tuning how long to microwave them and at what power level so they come out perfectly. I'm still in the trial and error phase with that. The instructions that came with the poacher weren't very helpful. I just love the warm egg yolk oozing down over the warm potatoes, roasted cherry tomatoes, chicken and other ingredients. If you're squeamish about a runny egg yolk just cook the eggs the way you like them. People with compromised immune systems also have to be careful about eating eggs this way. It sounds a bit strange but I squeeze fresh lemon juice over the salad, too. It compliments all the ingredients, giving the salad a fresh kick. So, next time you're looking for something different for lunch, say oui oui to my French bistro salad. Start with the base of arugula and cannellini beans and you can improvise from there. I listed the ingredients I used above. But you're going for the mixture of textures and temperatures - the crunchy, warm roasted potatoes, the delishiously soft roasted tomatoes, the warm chicken contrasting with the room temperature arugula and beans. The soft egg and tangy lemon juice pull the whole thing together. Be sure to dress the salad and add the egg and lemon last. Portobello mushrooms so meaty they can be a stand-in for steak! As many of my readers know, I am always looking for a new variation on the slider or mini hamburger. I've done tuna and salmon burgers - not to mention chicken sliders - so a portobello burger seemed to be a natural progression. I decided to quarter the two large portobello mushrooms. They cooked evenly that way. And I'd say two portobello mushrooms per person is a good serving size. They really shrink down considerably! I cooked the quartered portobellos in my trusty cast iron skillet. I cooked them in extra virgin olive oil and I added a generous squeeze of lemon juice about halfway through the cooking process. First, I got the skillet extremely hot - heating it over medium heat for about 5 - 10 minutes before adding the oil and mushrooms. If you don't adhere to the vegan diet, you can add a pat of butter in with the extra virgin olive oil to make them really decadent. With roasted eggplant and tomato on the side this dish makes a delicious dinner. Just be aware that there isn't much protein in this meal. Portobello mushrooms have 5 grams of protein per serving and eggplant has 2 grams. So if you're having this for dinner make sure that you got protein at breakfast or lunch. I intentionally thought up this recipe with practically no other ingredients than the mushrooms and eggplant. The portobellos are so flavorful they really don't need garlic or hot peppers to make them taste interesting. Give it a try! Note: My cast iron skillet has lines across the bottom which look like grill marks as if you cooked your mushrooms on a charcoal grill. Worth the investment! The portobello mushrooms even look a bit like steak filets!